The search for halon 1301 replacements has been on-going for over 10 years and each alternative brings with it a unique set of properties. We have brought to the market products that match the requirements of industry and our latest research allows us to introduce fire protection systems using Novec 1230 fluid , a new development with some advantages over current technologies. Novec 1230 fluid allows us to complement our existing range of agents as the phase out of halons accelerates in many countries around the world. Novec 1230 fluid is known as a fluorinated ketone and is manufactured by 3M. Novec1230 fluid has low toxicity and has a boiling point of 49 degrees C and therefore exists as a liquid at room temperature. Novec1230 fluid contains neither bromine nor chlorine and has zero 0zone depleting potential. When fire breaks out in server rooms, data centres, museums and other sensitive environments, sometimes the solution can be as damaging as the fire. Gielle’s Novec 1230 fire suppression system uses an inert carbon-based chemical that powerfully fights fire yet is safe for property, people, and to the environment. It looks like water but doesn’t cause the damage normally associated with water because it contains no moisture. The result is lower repair bills and less impact on business. Novec 1230 has no harmful impact on the environment. It has an atmospheric lifetime of only five days while the closest chemical alternative has an atmospheric life time of 33–36 years. Federal Government regulations for Ozone Depleting Substances and Synthetic Greenhouse Gases (ODS and SGG), places usage restrictions on chemicals that are defined as controlled substances due to their potential to harm the atmospheric environment. As an environmentally safe inert carbon-based chemical, Novec 1230 is exempt from this legislation. Protect your sensitive business data and equipment with Novec 1230. 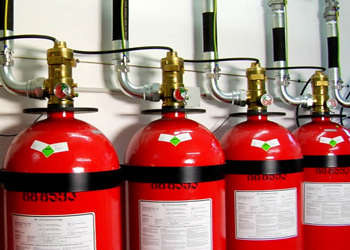 Novec™ 1230 Fire Protection Systems is engineered to provide clean, fast, people-safe protection for applications requiring a “green” solution to fire suppression. The system includes detectors, a control unit, agent storage cylinders, piping and discharge nozzles. The system is computer calculated to provide system discharge within 10 seconds. and a 10% NOAEL level. Another major advantage of 3Mâ„¢ Novecâ„¢ 1230 Fire Protection Fluid is its wide margin of safety in use - providing more flexibility in system design compared with other halon alternatives and ensures that occupants can safely egress the space since the NOAEL will not be exceeded. This environmental profile is unmatched by any other halogenated agent, and helps make 3Mâ„¢ Novecâ„¢ 1230 Fire Protection Fluid today's long-term solution for protecting high value assets. Novec 1230 Fire Protection Fluid is an environmentally acceptable, people compatible, clean agent for vital facilities with a wide range of hazards. Novec 1230 Fluid suppresses the fire by removing the heat energy and interrupting the combustion process. With extinguishment capabilities of 10 seconds or less, Novec 1230 Fire Protection Fluid has the capability to extinguish fires fast and effectively â€“ before any damage is done to your valued assets. 3Mâ„¢ Novecâ„¢ 1230 Fire Protection Fluid offers a number of important advantages over other clean agents and CO2 in marine applications. 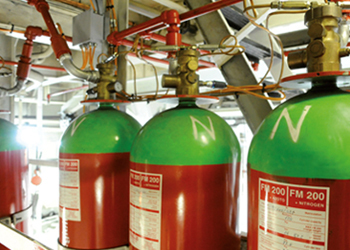 Because it is a liquid at room temperature, and stored at low vapor pressure, agent handling and charging of systems using 3Mâ„¢ Novecâ„¢ 1230 Fire Protection Fluid are greatly simplified, and can be accomplished without removing the cylinders offsite. This can be an especially important consideration for servicing offshore facilities - saving time and ensuring uninterrupted protection of assets. The liquid state of Novec 1230 fluid also allows for efficient use of space, requiring about the same number of cylinders as conventional halocarbon agents. The product can be shipped safely by air in bulk quantities, without regulations or restrictions. 3Mâ„¢ Novecâ„¢ 1230 Fire Protection Fluid offers a number of unique advantages for protecting records stored on various electronic media; paper documents; archival film and video; fine arts, antiques and other valuable - and often irreplaceable â€” items which are vulnerable to conventional water, foam and dry chemical extinguishing agents. 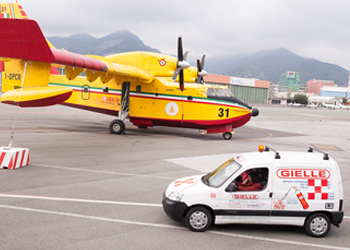 The Gielle Systems are automatic suppression systems using 3Mâ„¢ Novecâ„¢ 1230 Fire Protection Fluid and consisting of four basic components and their associated accessories. 3Mâ„¢ Novecâ„¢ 1230 Fire Protection Fluid is a highly efficient fire extinguishant designed especially for "special hazards." These are defined as spaces â€” such as telecommunication switch rooms, computer and electronic control rooms â€” where maintaining continuous operation of high-value equipment is critical. Novec 1230 Fire Protection Fluid is based on a proprietary chemistry from 3M called C6-fluoroketone; it is also known as dodecafluoro 2-methylpentane-3-one; its ASHRAE nomenclature is FK 5-1-12 â€” the way it is designated in NFPA 2001 and ISO 14670 clean agent standards. 3Mâ„¢ Novecâ„¢ 1230 Fire Protection Fluid is a high molecular weight material, compared with the first generation halocarbon clean agents. The product has a heat of vaporization of 88.1 kJ/kga and low vapor pressure. Although it is a liquid at room temperature it gasifies immediately after being discharged in a total flooding system. There's a distinct advantage in handling a liquid agent-one that isn't pressurized and doesn't have a high vapor pressure at room temperature. 3Mâ„¢ Novecâ„¢ 1230 Fire Protection Fluid has a boiling point of 49Â°C (121Â° F). It can be shipped safely and effectively, without any restrictions, by air at a moment's notice in bulk quantities. In the shop, Novec 1230 fluid is easier to use than pressurized gas. Simply transfer the fluid from the container to the system cylinder, using a simplified closed loop process to avoid contamination. Then, superpressurize the cylinder with nitrogen. The product is ideal for use in total flooding applications, localized flooding systems, directional spray type applications and may be used in portable extinguishers for specialized applications. But in addition to the conventional methods of super-pressurization using nitrogen, 3Mâ„¢ Novecâ„¢ 1230 Fire Protection Fluid also lends itself for use in pump applications because it is a liquid. 3Mâ„¢ Novecâ„¢ 1230 Fire Protection Fluid has been shown to be compatible with typical materials of construction used in fire suppression systems. The material is stable and essentially inert, meaning it does not react with system components. It's also non-corrosive in its neat form. Long-term testing has demonstrated excellent compatibility with various elastomers used in o-rings, gaskets and other types of seals. However, we recommend that the product not be used with fluoroelastomers, because they are similar in composition to Novec 1230 fluid and have an affinity for each other, making them incompatible. 3Mâ„¢ Novecâ„¢ 1230 Fire Protection Fluid doesn't just put out fires. With the new 3Mâ„¢ Blue SkySM Warranty, it also puts your mind at ease. If 3Mâ„¢ Novecâ„¢ 1230 Fire Protection Fluid is banned from or restricted in use as a fire protection agent due to ODP, or GWP, 3M will refund the purchase price of the Novec 1230 fluid. That's a promise and performance you can take to the bank. If 3Mâ„¢ Novecâ„¢ 1230 Fire Protection Fluid is banned from or restricted in use as a fire protection agent due to ODP, or GWP, 3M will refund the purchase price of the Novec 1230 fluid. Warranty good for 20 years. Must register your system with 3M within 30 days of system commissioning and every five years. For complete terms and conditions or to register your system for the 3Mâ„¢ Blue SkySM Warranty, log onto www.3M.com/novec1230fluid. All organic compounds that are emitted into the atmosphere have the ability to act as a greenhouse gas. Their effect in the atmosphere or potency as a greenhouse gas is determined by the amount of infrared (IR) radiation they absorb and how long they reside in the atmosphere (their atmospheric lifetime). These factors are combined in a calculation and expressed in a single parameter known as the Global Warming Potential (GWP). When released to the atmosphere, 3Mâ„¢ Novecâ„¢ 1230 Fire Protection Fluid absorbs infrared (IR) energy similarly to other fluorinated compounds. What sets 3Mâ„¢ Novecâ„¢ 1230 Fire Protection Fluid apart from these other fluorochemicals is its very short atmospheric lifetime. Most fluorochemicals reside in the atmosphere for years - often on the order of decades or centuries. In contrast, Novec 1230 fluid degrades very rapidly in the lower atmosphere by reaction with sunlight (a process known as photolysis). This leads to a very short atmospheric life for Novec 1230 fluid of just 5 days. The very short atmospheric lifetime of 3Mâ„¢ Novecâ„¢ 1230 Fire Protection Fluid leads to a very low Global Warming Potential (GWP). The GWP essentially determines how many kilograms of CO2 - the world's most common greenhouse gas - would be equivalent to the release of one kilogram of this compound. The GWP for Novec 1230 fluid is 1. This means that is essentially the same as releasing the same amount of CO2. For example, abatement of HFCs of materials in fire protection applications is one strategy that companies can employ to reduce their overall emissions of materials in the "basket" of six greenhouse gases identified by the Kyoto Protocol. In addition, many forward-thinking companies are beginning to consider the potential costs of monitoring and reporting their use of greenhouse gases; and the cost and disruption to replace an HFC-based system in the near future, should new restrictions on HFCs, now being debated in the EU and other parts of the world, come into force. Ultimately, a growing number of end-users are concluding that long-term economics â€“ as well as good stewardship â€“ favor the use of sustainable technologies, such as 3Mâ„¢ Novecâ„¢ 1230 Fire Protection Fluid. Because its use concentration is much lower than its No Observable Adverse Effects level (NOAEL), 3Mâ„¢ Novecâ„¢ 1230 Fire Protection Fluid offers the widest margin of safety of any viable halon replacement available on the market today. Note: Industry standards require egress from a protected enclosure prior to system discharge.